Food tops many travelers’ agendas. The question I receive most frequently from friends going on a trip is “where should I eat” because they know my love of researching foods in different destinations. I want to know what’s popular, what’s iconic, and what’s a must-eat in a city before I travel and have been putting together Must Eat Lists for years. Whether it’s the first time or the 10th time I visit, you can bet I will have a list of new and favorite places to eat on every trip I take, even if it’s back home to Portland Oregon – a foodie mecca with a constantly evolving culinary scene. Exploring and learning about a destination through its food is one of the most delicious and fun ways to learn about people and their culture. Who can go to New York and not have a famous slice of pizza or bagels with a schmear from the local deli? Not me! Or how about New Orlean’s beignets? Yum! You can’t miss these morsels of a city’s identity. You don’t have to travel far. Exploring your own hometown is still considered “Food Tourism” according to the World Food Travel Association, and I couldn’t agree more. Since most of us can’t afford 365 days on the road, the next best thing is to travel through food at a local restaurant, and let them take you on a journey. Those local food experiences help inspire dreams of travel and hopefully will help you, like me, cross of those trips from your bucket list and #MakeSomedayHappen. Restaurant directories are often destination-oriented: Italian, French, German, Cuban, Vietnamese, Mexican Southern, etc. If you’ve dreamed of traveling to France, why not go to your local French restaurant and keep the dream alive? Some restaurants also have chefs who enjoy preparing special dinners themed around a destination. Those events are my favorite, and are often featured on my Top 9 Lists, because the chef has an opportunity to let loose and showcase their creativity. Chef Fred Vlachos’ superpower is to transport you around the world in one night! 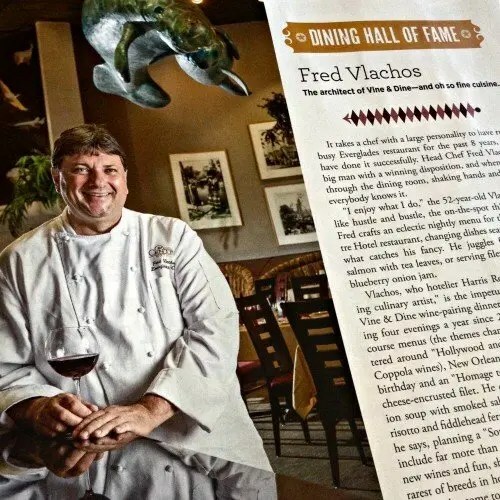 Orlando’s chef Fred Vlachos, inducted into the Orlando Culinary Hall of Fame, is an expert at creating five-course wine pairing menus for the popular Vine & Dine Wine Dinner series at Everglades Restaurant. His superpower is the ability to transport you from coast to coast and around the world in one night. 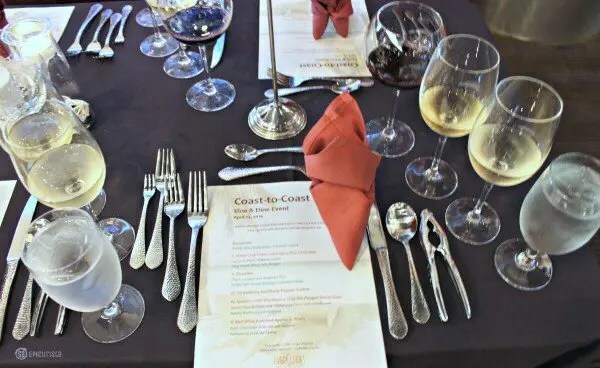 During my 2014 12 days of Birthday Celebrations, I chose their “Journey From Coast to Coast” Wine Dinner as one of my 12 celebrations and what a special birthday treat that was. Looking at the pictures, I am instantly transported once again. Those flavor memories will be with me always. 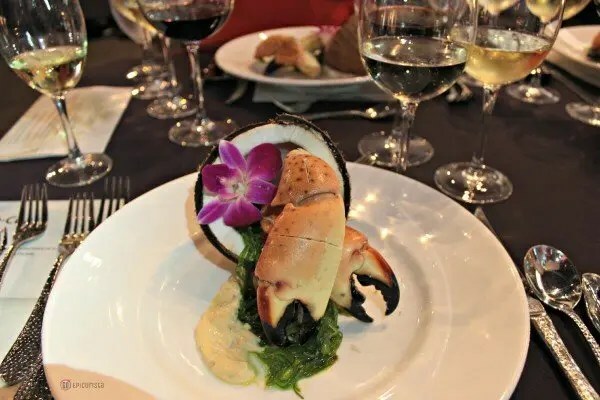 We started in Key West Florida with succulent Stone Crab Claws topped with a spicy key lime aioli sauce, presented beautifully in a coconut shell atop a Wakame salad. Looking at that plate, all I could think of was the sounds of the ocean waves, my toes in the sand and the warm breeze in my hair. The dish was paired with King Estate Pinot Gris from Oregon, effectively taking me from the East to West coast with each sip and back with each bite. This was my favorite pairing of the night as it combined by two favorite U.S. destinations, Florida and Oregon. Look at this and imagine you are in Key West! Our next stop was New Orleans Louisiana, the land of award-winning cuisine, for their famous Étouffée. 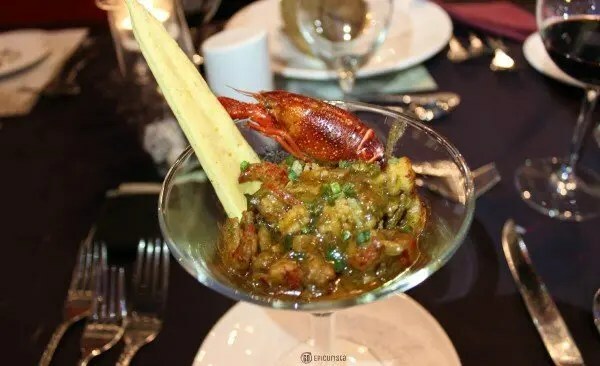 This spicy Cajun stew of seafood and vegetables in a dark roux served over rice had the perfect amount of spice, topped beautifully with a crawfish and citrus cracker. The fruity sweetness of the Pacific Rim Sweet Riesling from Columbia Valley was a welcome contrast to the spiciness of the dish. I can’t wait to visit New Orleans again! From the bayous of Louisiana! 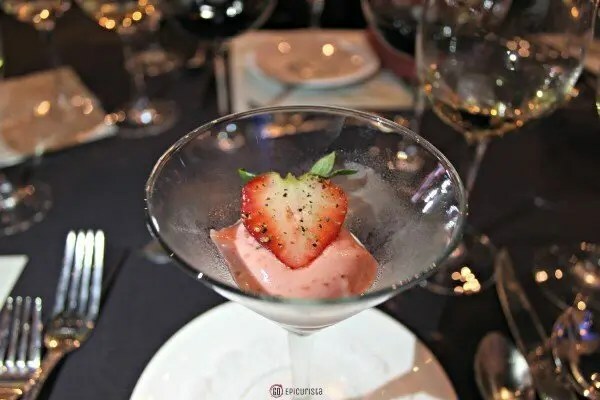 As an intermezzo, we cleansed our palates with a refreshing Florida Strawberry and Black Pepper Sorbet. I love the use of pepper in fruit dishes as it always gives the fruity flavors a pop. I could have eaten several servings, it was so good. Visit Plant City Florida for their sweet strawberries! 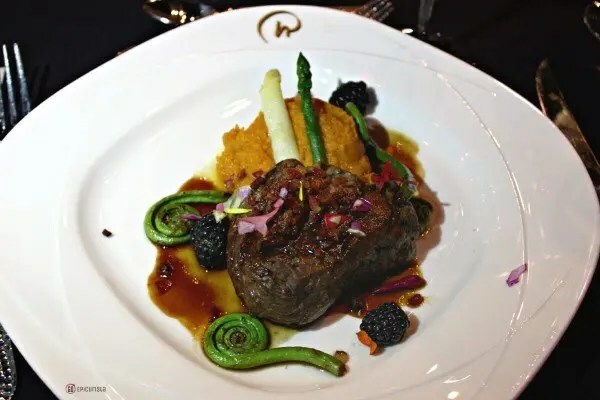 We continued our travels across America as the main course arrived – Venison with Blackberry Chipotle Pepper demi-glace, served with sweet potato mash and fiddlehead ferns with wildflowers. It was as if Chef Fred stopped on the side of the road to handpick the greens, they gave a pleasing crunch and freshness to the savory dish. Everglades is one of the few restaurants in Orlando to serve game. You will find Venison and Buffalo filet on their regular menu and this venison was cooked to perfection. The sauce had a sweet ‘jamminess’ with a touch of heat from the chipotle, which complemented the rich flavors of the venison. The sweet and spicy flavor combinations were a recurrent theme in this dinner, much to my delight. The dish was paired with Kuleto Estate Native Son from Napa Valley California, a red blend of Zinfandel, Cabernet Sauvignon and Sangiovese. The deep black and red fruit flavors of cherries and currants with a touch of pepper and tobacco provided a balanced pairing. Our final destination was Washington State, known for their deliciously juicy apples and pears. Pastry chef Stephan Schmidt prepared a Red Wine Poached Apples and Pears dessert that had us all ‘oohing’ and ‘aahing’ when it arrived at the table. 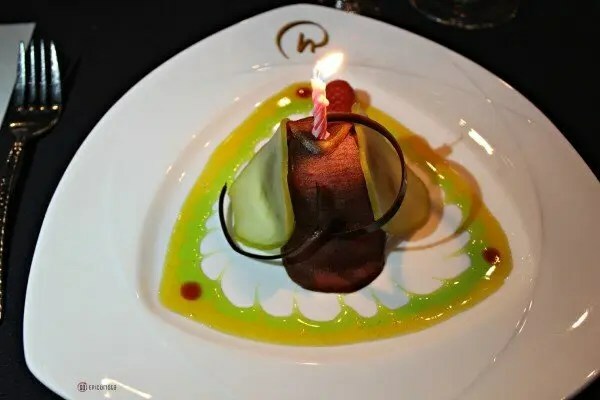 The wine-soaked fruit was masterfully arranged atop a rich dark chocolate mascarpone mousse with a meringue center surprise, which provided a wonderful combination of creamy and crunchy textures and flavors. The dish was paired with Fonseca 10 year old Tawny port, now taking us from the west coast of the United States to the coast of Portugal, in just one sip. A special birthday treat taking me to the Pacific Northwest & Portugal! 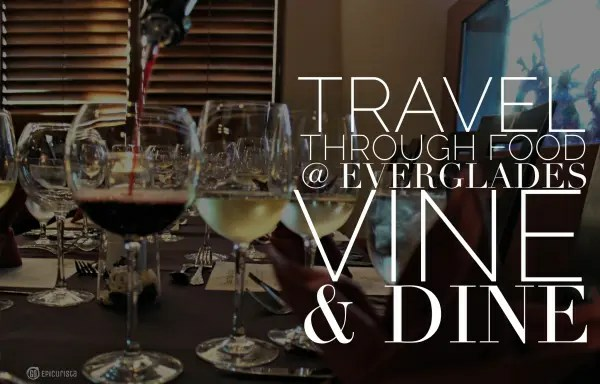 The team at Everglades Restaurant, located at the beautiful Rosen Centre Hotel in Orlando, has been wowing a loyal following at these Vine & Dine Wine Dinner Events for over 8 years. I must disclose that I helped create this wine dinner series, when I was the hotel’s Resident Manager overseeing their Food & Beverage department, and I couldn’t be more proud to see them continue such a creative culinary endeavor. It was always so much fun to create these events with the team and then sit down and enjoy the amazing food and wines with our guests. Everglades Restaurant kicks off the 2015 Vine & Dine Wine Dinner series on Friday January 30th and I encourage you to GO make your reservation and experience travel through food. Chef Fred Vlachos, restaurant manager Gabriela Henry and their team are sure to impress you with their talent and hospitality. Each event starts with a welcome reception wine or cocktail in the Everglades bar. The five course dinner is hosted by an expert wine speaker or Sommelier to guide you through the wine selections. Cost is $75 per person plus tax and service charge and includes complimentary valet parking. Special room rates are also offered based on availability for those that want to make an evening of it. Call 407-995-8560 for reservations as space is limited. ^ January 30: “Hunters & Gatherers” themed dinner with a menu of wild game and rustic flavors paired with Frog’s Leap Winery wines. ^ March 20: “Cooking with Wine” themed dinner where a featured ingredient in each dish will be the same varietal of wine it is paired with. You get double the wine! ^ May 22: “A Mycologist’s Dream” themed dinner paired with champagne. If you love mushrooms and you love bubbles, this is the event for you! ^ October 9: “Love at First Bite” Halloween themed dinner. This was always my favorite dinner of the year and I can’t wait to see what ghoulish and delicious tricks and treats Chef Fred has up his sleeve. Traveling through food is something you can do anywhere. I hope you are inspired to GO! Explore the world one delicious bite, sip and trip at a time and Make Someday Happen. Everglades Restaurant is located at Rosen Centre Hotel, 9840 International Drive, Orlando FL. 407-996-9840. Amazing pictures of amazing food. Thanks for posting! Thank you so much for checking out GO Epicurista! This was a fantastic dinner and one of the reasons I love taking food pictures. I get to relive that amazing experience every chance I get! Cheers! Next time, take me with you to Key West!! Chef Fred in Everglades will take us there! Looks like you had an amazing time! Oh, and I LOVE fiddleheads! :). It was wonderful! My first time trying fiddlehead ferns and they were surprisingly good. Loved the crunch! Thanks for stopping by GO Epicurista! Cheers! Thank you so much Jeff! I appreciate you checking out GO Epicurista! Wishing you tasty travels! They do a great job cooking game that doesn’t taste gamey. The venison and buffalo are my favorite, so tasty and really good for you too. Thanks Shelley for stopping by Go Epicurista! Cheers! OMG that food looks amazing! I’m always impressed when food looks almost too pretty to be eaten. Yummm some of these weeks courses sound too good to be true! Bring me a fork ASAP. Looking at these pictures I got hungry all over again! I love beautiful presentations and the Everglades culinary team does a great job with looks and taste! Thanks Renee for stopping by GO Epicurista. Cheers! Thank you Adriana. It’s going to be a delicious year at Everglades Restaurant. Better make reservations soon! Thanks for the (virtual) culinary road trip! Chef Fred is a master! I love culinary road trips even the virtual kind! Thanks for stopping by the blog Kelly. Cheers!